The Pixie Gold Slot is a Lightning Box Games slot with eight reel, 3-4 rows and 1296 paylines. The large number of paylines are generated with the Reelfecta, an invention of Lightning Box which we explain below. Just like the Druides Slot the Pixie Gold has a fairytale theme and as mentioned the Reelfecta feature. With its large number of paylines, you can continuously make smaller profits. Starting at 50p you can play the Pixie Gold up to a maximum bet of £100. The slot is also available to you from smart phones or tablets to play. In addition to the Reelfecta, the game also has a re-spin feature, which is another important feature. Symbole and Payouts: The Pixie Gold Slot has theme related symbols which are also the higher paying symbols. In addition, the known playing cards land on your reels symbols 9, J, Q and K. These symbols pay 50x your bet with a combination of 5 identical symbols. The theme icons are the king, the mushroom house, a snail, a ladybird, a little green pouch and a pair of acorns. The mushroom house pays up to 100x your bet and the king is the most valuable symbols up to 250x your bet. The little blonde girl is the games Wild and only lands on the 3rd reel. It replaces all symbols except the golden K.
Reelfecta Reel: Before we explain the main feature to you, we want to tell you how the Reelfecta reel works. This reel is basically your 3rd reel of 5 overall. It does not consist of 3 or 4 symbols, as usual, but 16 symbols. Of course that also makes it easier for you to build winning combinations. It’s a bit confusing at the beginning when playing with the Reelecta. We recommend you to click on the slot banner on the right and test the game for free. Then you can better understand how the Reelfecta works. 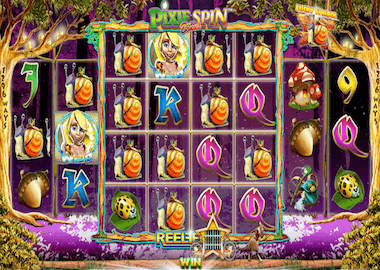 Pixie Spins Feature: The Pixie Gold Slot comes with a single bonus feature which is the Pixie Re-Spins feature. You will trigger the feautre when the King Star symbol, the golden K, appears above a cart. During your re-spin or pixie spin, the wild pixie symbol is added to reel 2 as well. In addition, a lucky symbol will be added to your Reelfecta reel. It’s possible to fill the whole of the Reelfecta with the single symbol and then you can make some seriously big profits. The feature is not very long, but you trigger it regularly when you are in the base game. Lightning Box Games is an Australian software company based in Sydney. It has already released some really exciting games for online casinos including the Redroo Slot, More Monkeys (with Australian themes) or the Chilli Gold and the Viking Fire Slot. All of these online slots and more can be played here for free on the Lightning Box Review page. Of course we also have some very good UK licensed Lightning Box Games casinos like the O’Reels, Miami Dice or the Dream Vegas Casino. In each of the casinos you get after your registration a welcome bonus and free spins.